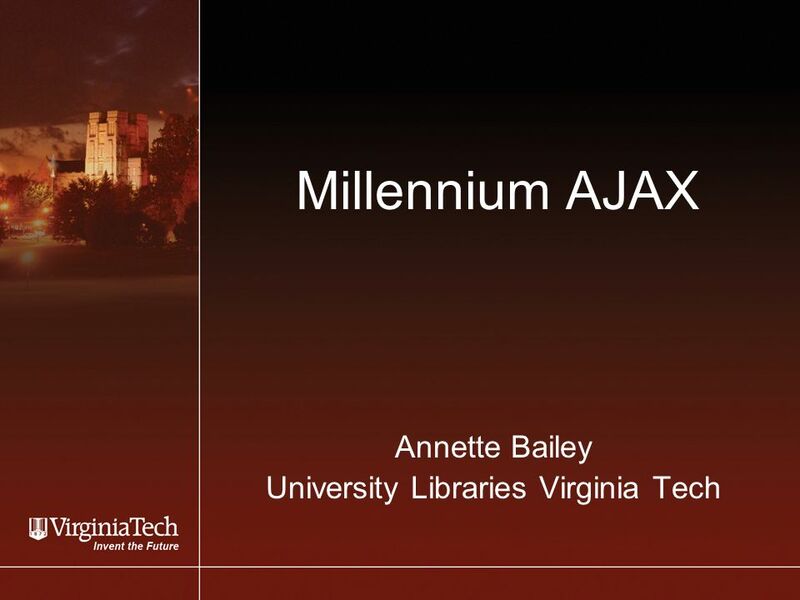 Millennium AJAX Annette Bailey University Libraries Virginia Tech. 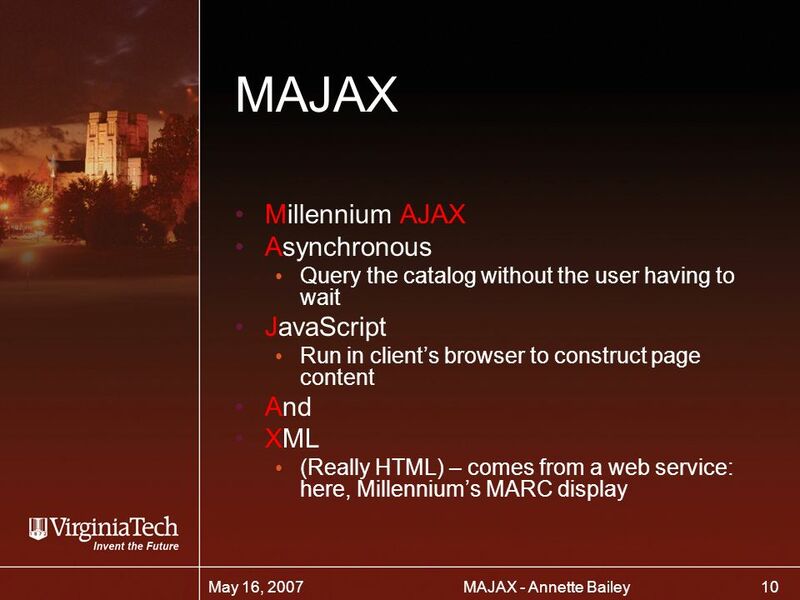 24 24 MAJAX - Annette BaileyMay 16, 2007 Performance MAJAX imposes additional load on your server Currently self-limiting to 20 requests per second per page, which can be changed. 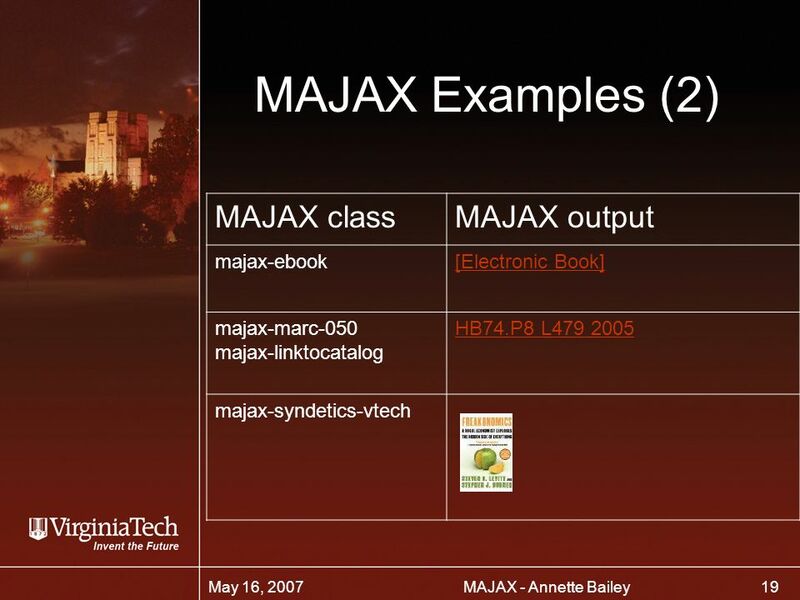 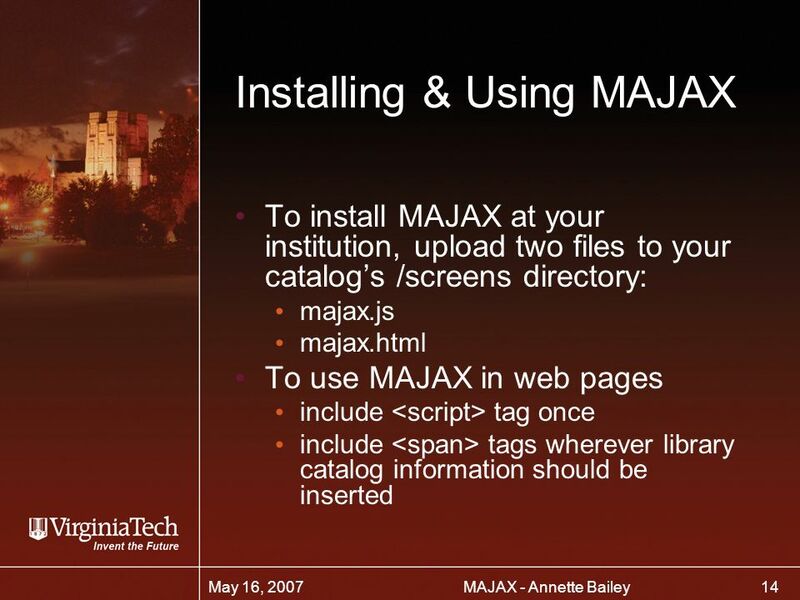 To turn MAJAX capabilities off, simply remove majax.html & majax.js from the /screens directory. 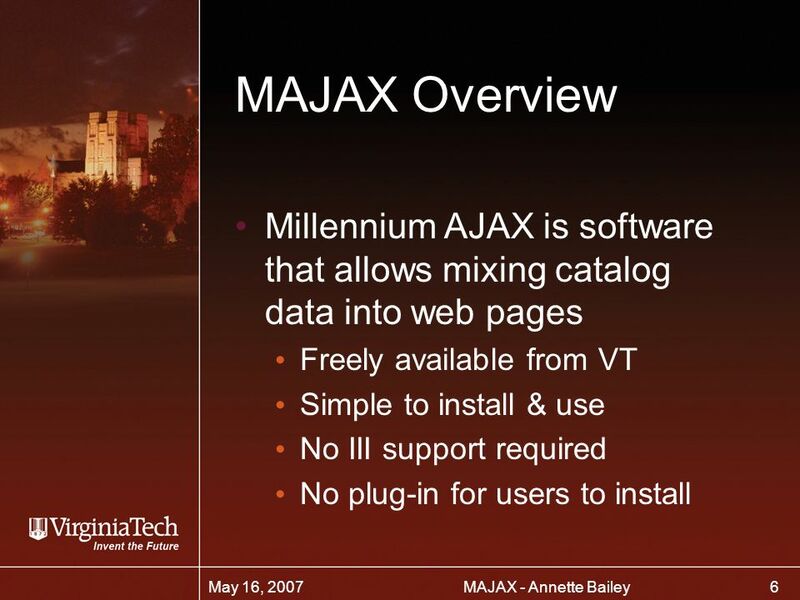 26 26 MAJAX - Annette BaileyMay 16, 2007 Summary MAJAX provides the ability to include live catalog information in any webpage on your domain Without special server access or support Without requiring end users to install any plug-ins It is easy to use, requiring only HTML skills Free! 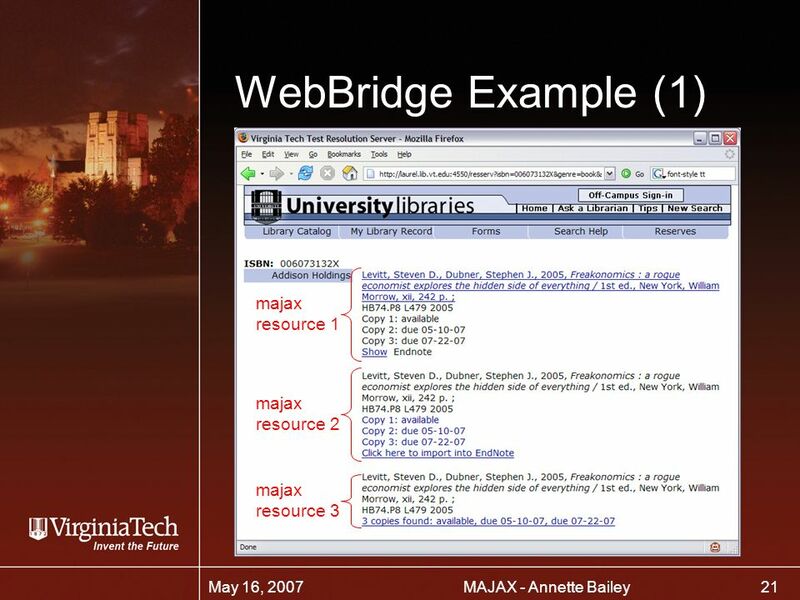 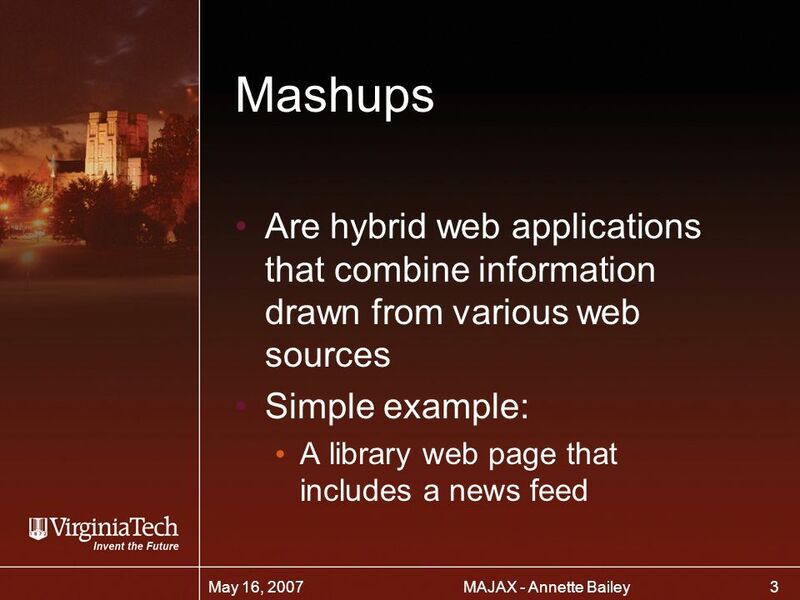 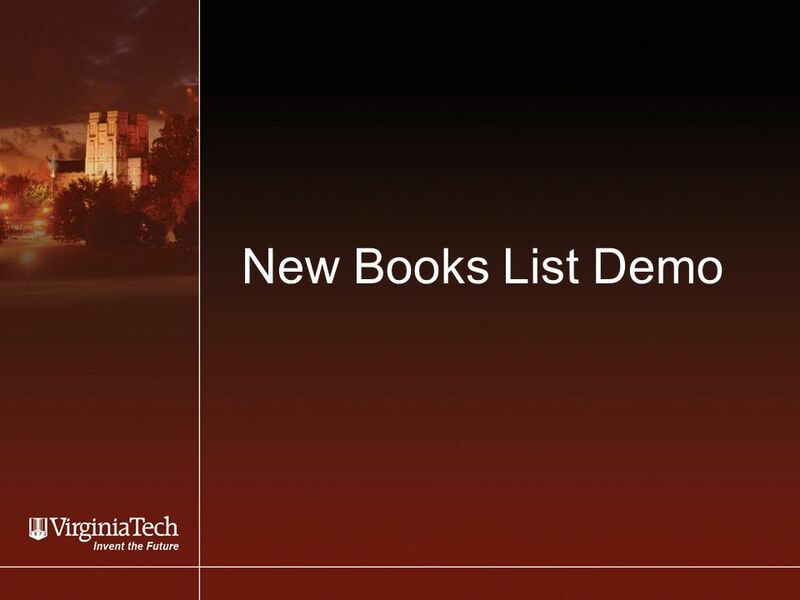 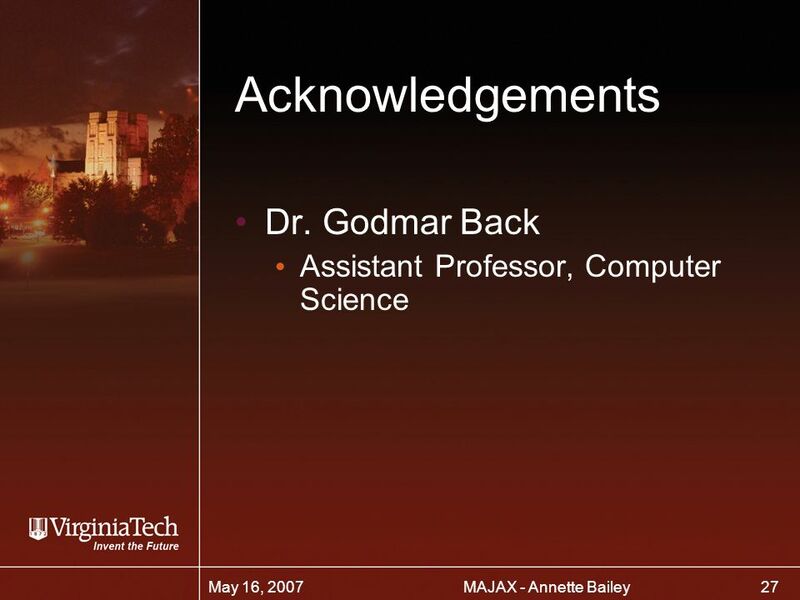 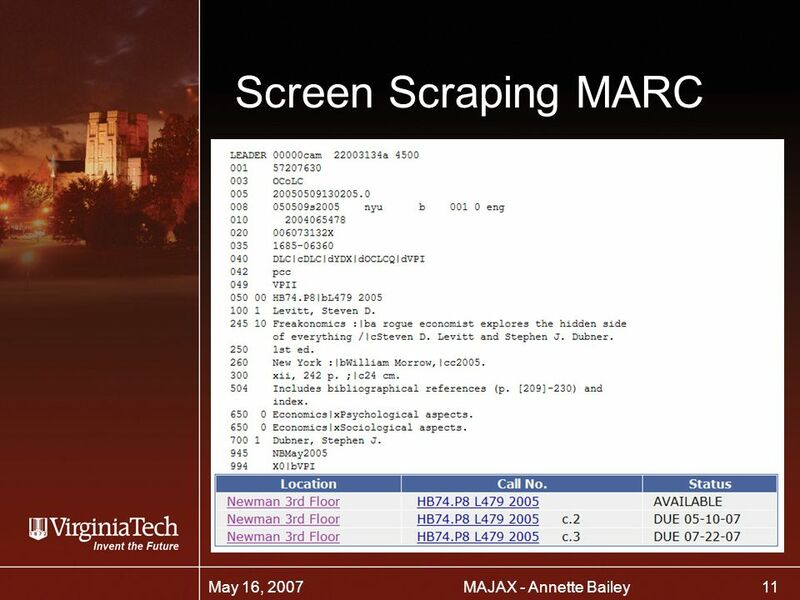 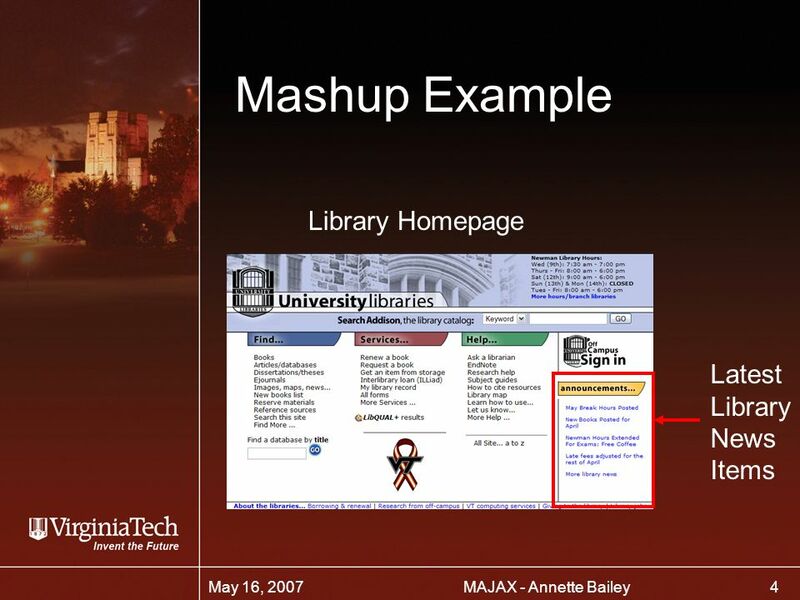 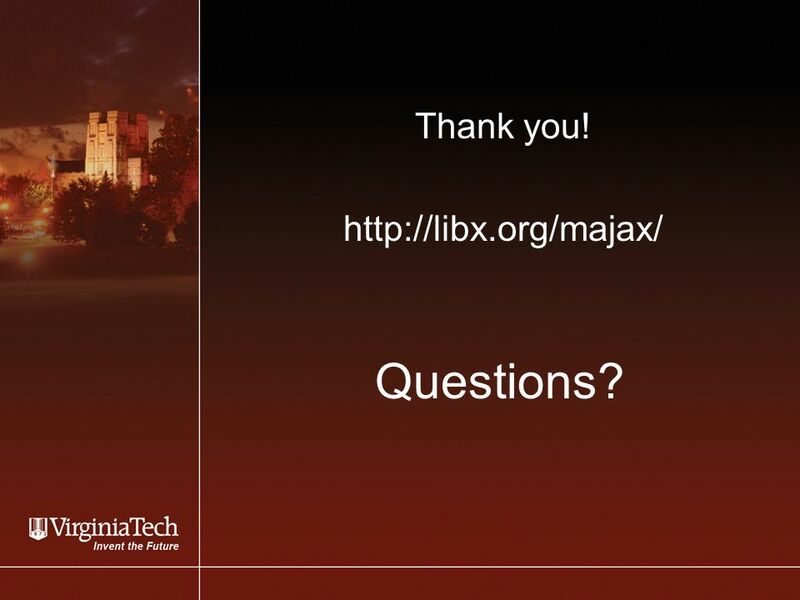 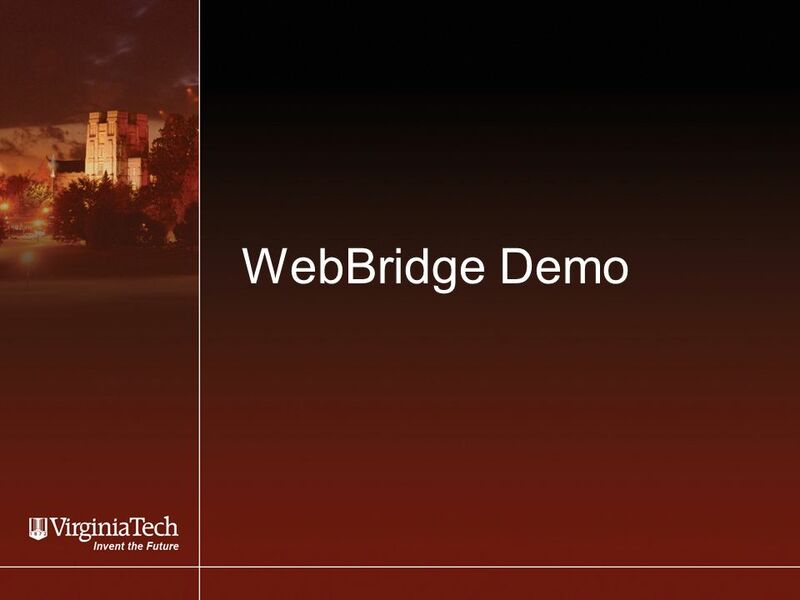 Download ppt "Millennium AJAX Annette Bailey University Libraries Virginia Tech." 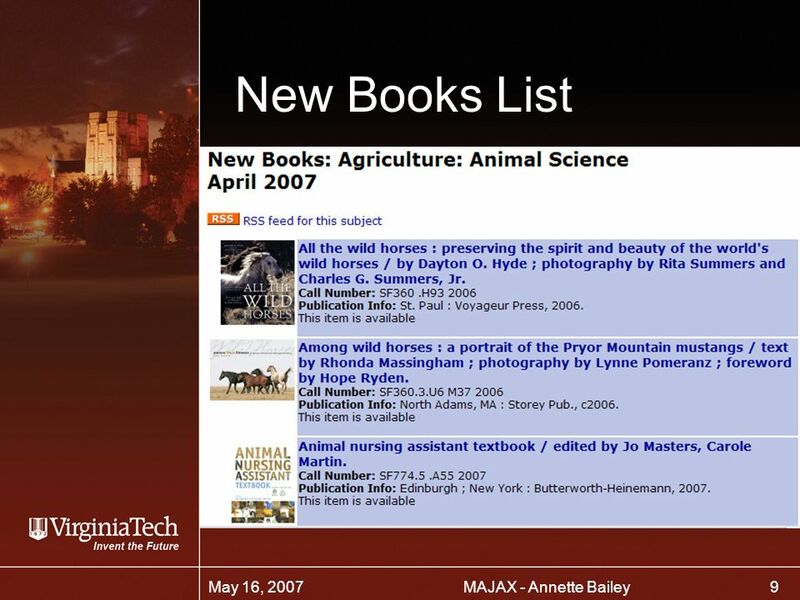 Using MAJAX and Google Book Classes in Mashups Annette Bailey University Libraries Virginia Tech April 29, 2008. 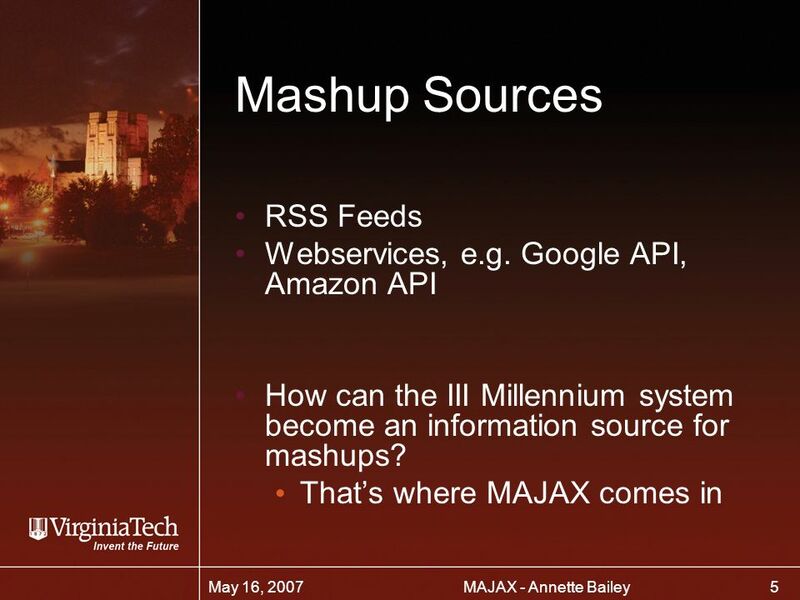 Analog v. Google in the CMS: RSS Feeds to the Rescue! 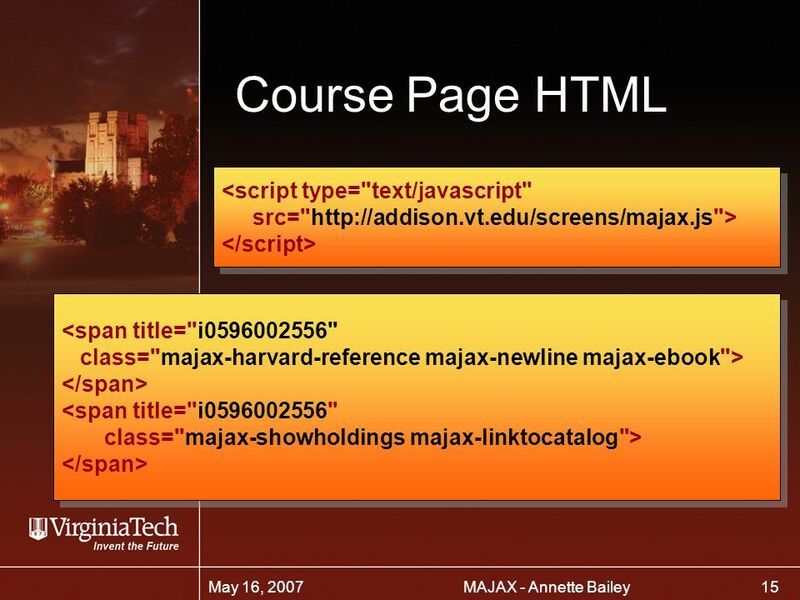 Final Project Instructor: Nguyen Anh Tu Students: Tran Tien Tai Tran Tien Tai Tran Ngoc Mai Tran Ngoc Mai Tu Kim Tuan Tu Kim Tuan Nguyen Ngoc Phuong Nguyen. 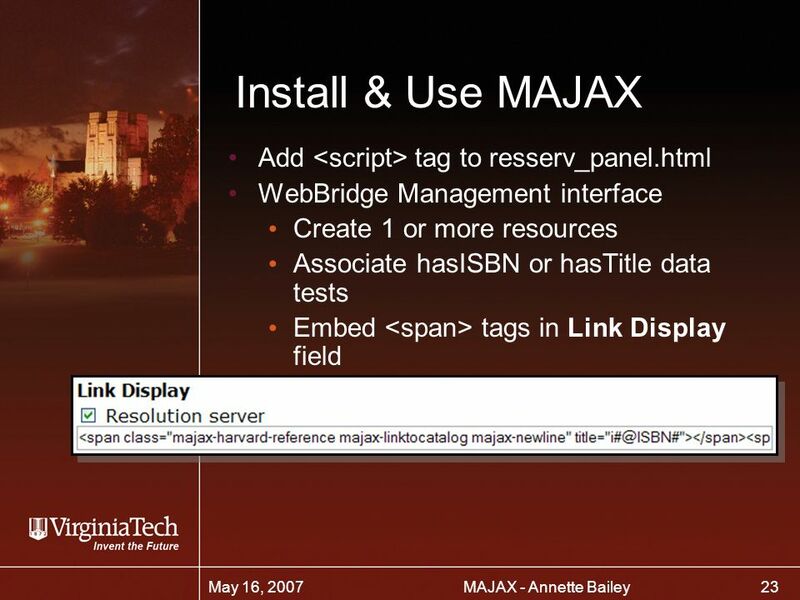 © 2002 D & D Enterprises 1 Linking Images For Navigation & Clickable Image Maps. 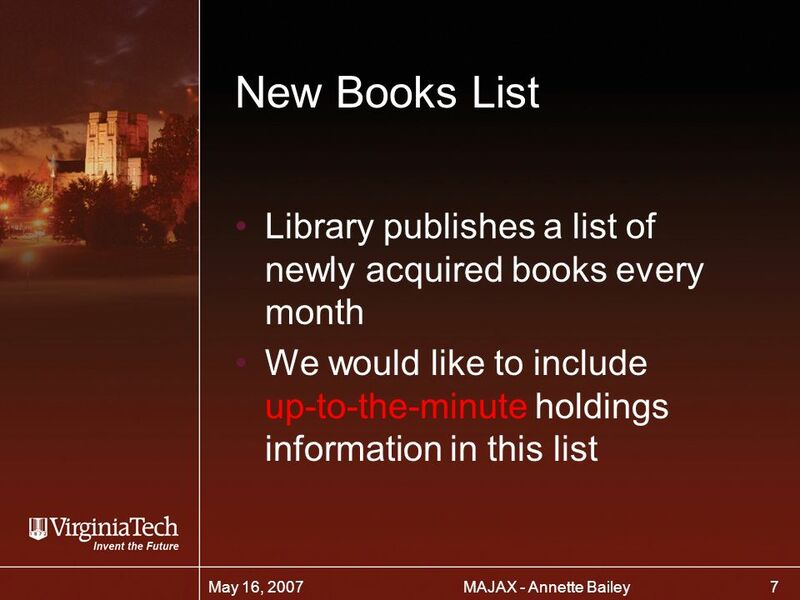 Our library has two forms of encyclopedias: Hard copy and electronic versions. 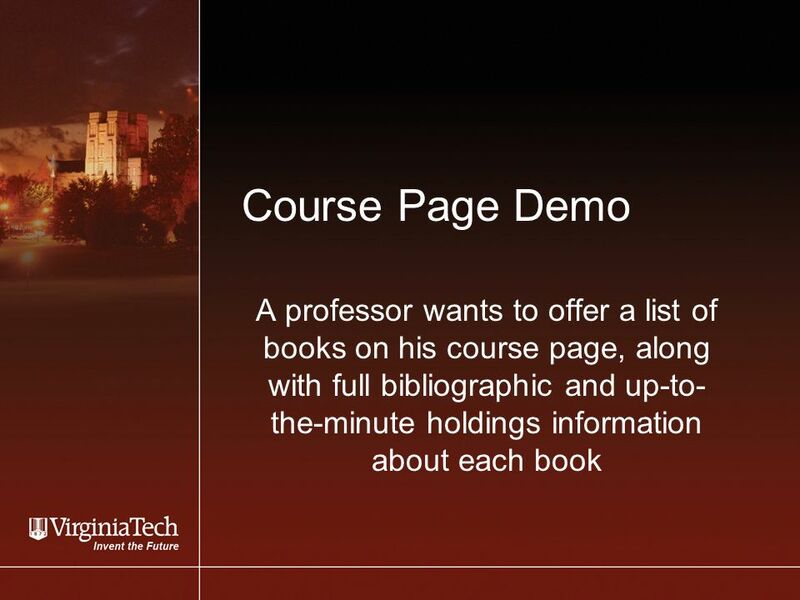 The first is simply the old-fashioned "book on the shelf" type of encyclopedia. 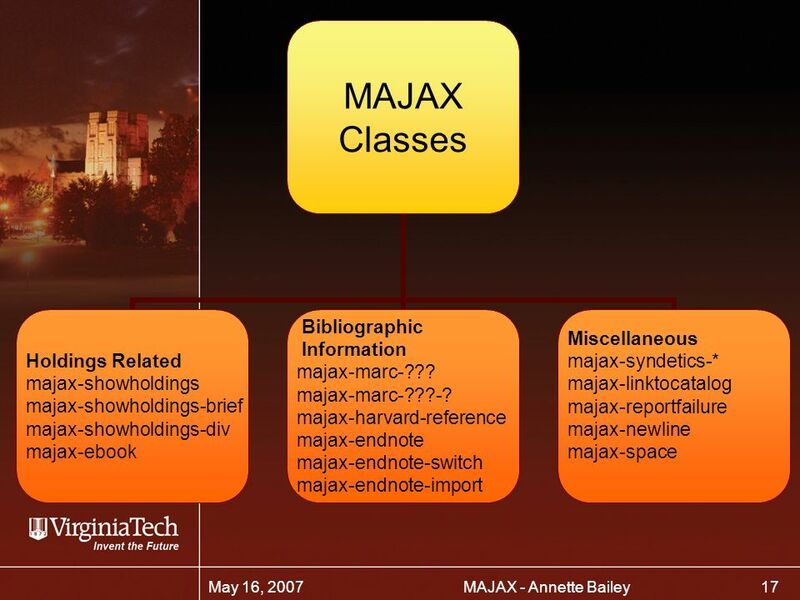 OvidSP Flexible. 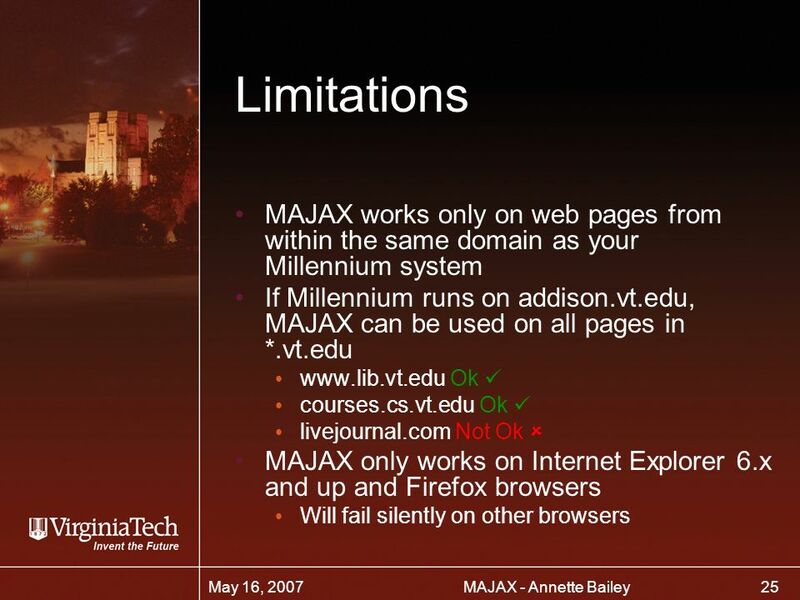 Innovative. 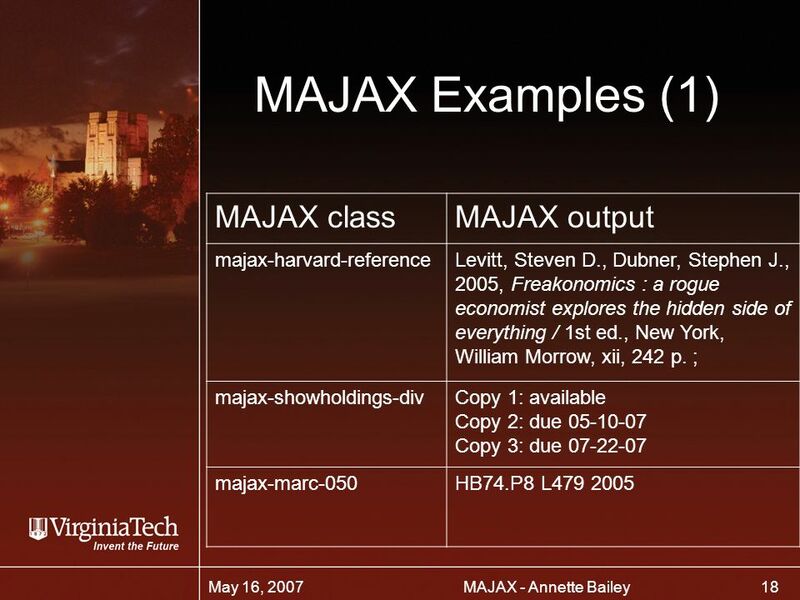 Precise. 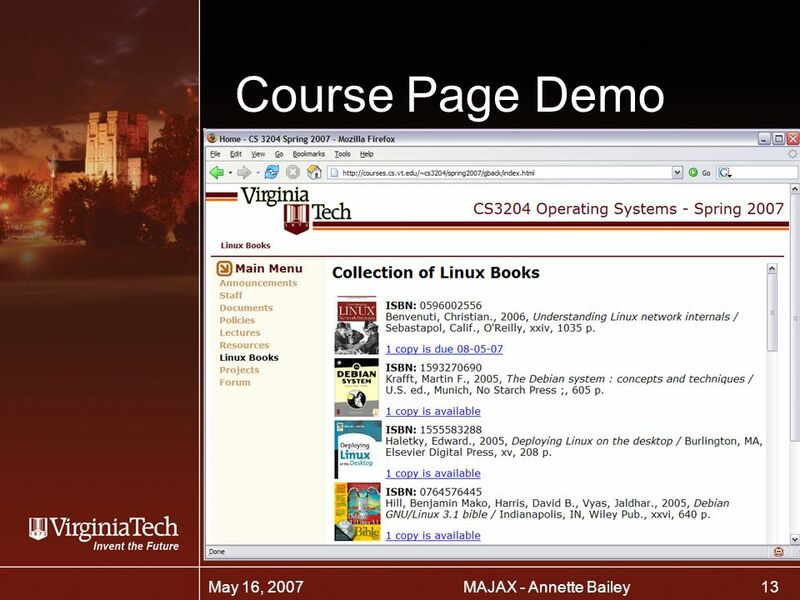 Introducing OvidSP Resources. 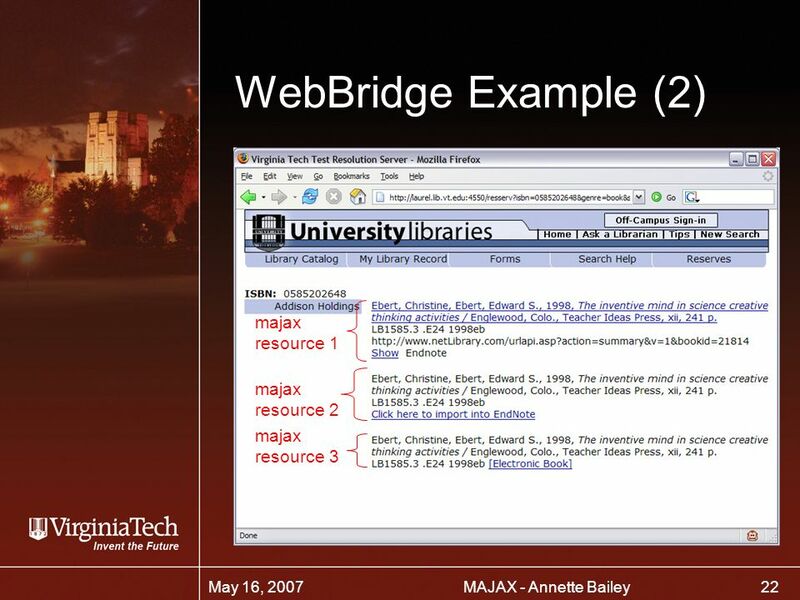 LibX – Putting Millennium and WebBridge in Firefox Annette Bailey Newman Library, Virginia Tech May 21, 2006. 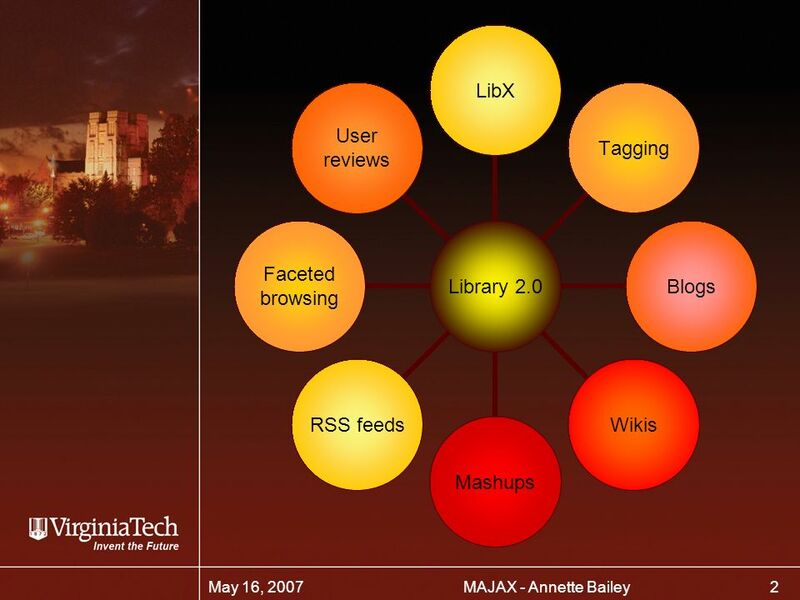 1 LibX – Connecting Users and Libraries Annette Bailey LITA National Forum October 2007. 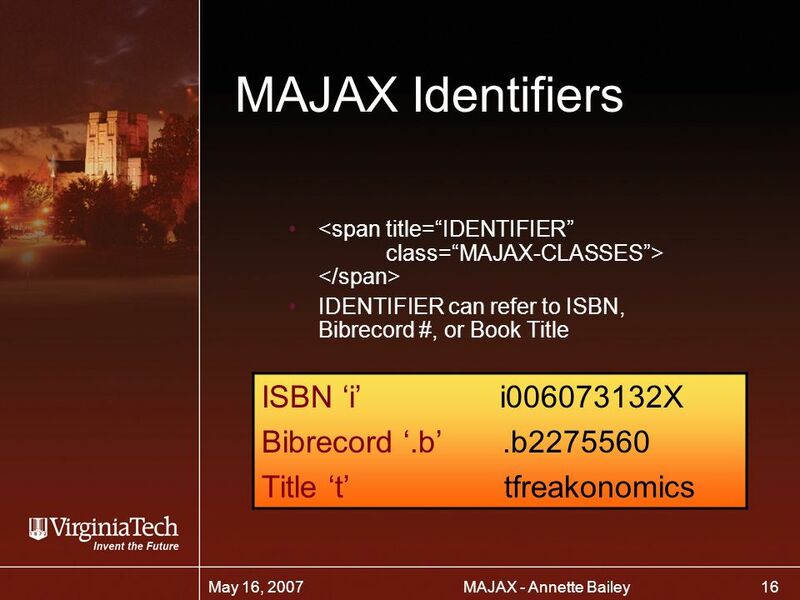 The Reinberger Childrens Library Center Step-by-step instructions for capturing a MARC record and adding a 658 Tag to a record.